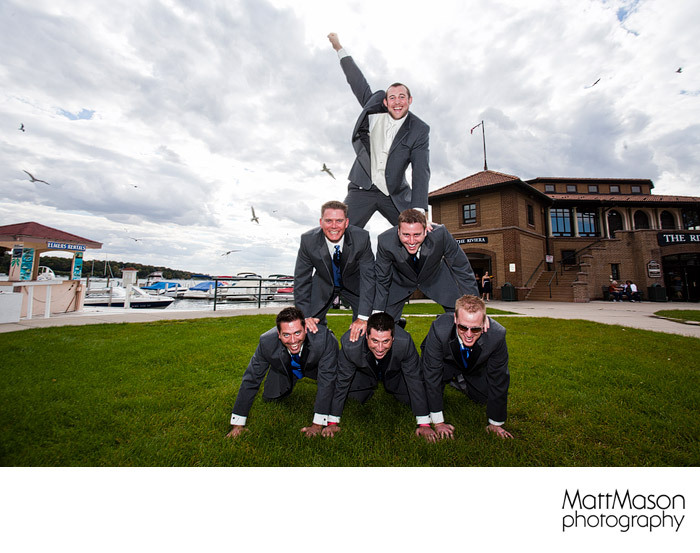 Kelly & Mike were married on 10-1-10 in Lake Geneva, WI at Hawk's View Golf Club. The day started with a first look at the end of the public pier by The Riviera. Mike waited patiently looking out over Lake Geneva for Kelly to tap him on the shoulder. After the two had a few minutes together we started shooting wedding party photos with a very cool wedding party. The guys were wearing fun thigh high yellow and black socks and we had a blast with those props. Here is the link to Kelly and Mike's photo gallery. Pumpkins, pies, a penguin, and baseball...these were just a few of the unique and fun things we experienced with Kelly and Mike. These two really thought through their wedding day and created a beautiful and enjoyable experience for their guests. I remember when I first met them. Mike told me the story of how he proposed. He used a remote control penguin to give her the ring. They brought it along to their engagement portraits and were happy to bring it to the wedding. Instead of cake they had pies. Pumpkin, blueberry, cherry, apple and the list goes on! They are avid baseball fans so they brought bats, gloves and ball and their guest book was a homeplate. So much fun you almost had to be there. Or you could look at the photos.